Nellie Edge Seminars and Workshops may be taken with a follow-up Practicum for 1, 2 or 3 semester credits (4.5 quarter credits). The registration form and fee of $62.00 per credit is payable to the University of the Pacific. You will fill out the form and attach your check on the day of our workshop. This requires a 15-hour “teacher-friendly” practicum follow-up project for each credit. The projects will support you in implementing the strategies shared during our professional development day. You will have up to 4 months to complete the practicum and extensions are available upon request. Submit course work to: Dr. Allan H. Lifson, Nellie Edge Seminar Follow-up, 729 W 16th St., Ste. B-3, Costa Mesa, CA 92627, 800-479-1995. See www.teacherfriendly.com for the most frequently asked questions about practicum follow-up. As in the past, we offer participants the opportunity to meet the practicum requirements with professional reading.Read the seminar manual or any of the professional books listed in the resource book bibliography. Write a three-page response paper to the book. Discuss how the research will affect your practices as an educator or include at least 3 new concepts or strategies that you will implement in your classroom as a result of your reading. This would qualify for one unit of practicum credit. Begin with our photo essays, e-Books, video clips, and links to our Annotated Literacy Award Websites and other favorite sites. Download poetry pages and Little Books. Gather resources for a particular theme or project. Join an informative professional chat board (we highly recommend teachers.net/mentors/kindergarten). Listen in or post questions. How will you systematically integrate more authentic writing activities across the curriculum? Reread Writing-to-Read Accelerates Literacy: Make an implementation plan. Read the book Kid Writing: A Systematic Approach to Journals, Phonics and Writing Workshop, by Eileen Feldgus and Isabelle Cardonick and visit their inspiring website www.kidwriting.com. Develop and evaluate your “kid writing” program. Train parents and volunteers to help. 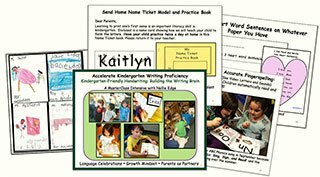 Implement the Susie Haas “Name Ticket” handwriting strategy and evaluate progress. You may choose to begin with a photo of yourself and a one-page personal philosophy statement about your teaching beliefs. Follow it up with at least 20 photos of children in your classroom actively involved in learning with concise captions under each photo. These pages can be kept in clear plastic sleeves in a 3-ring binder and shared with parents. You will see excellent models as you peruse www.nellieedge.com and websites from some of our Kindergarten Literacy Award teachers. Write your “community of learners” plan for the first day of school. How will you greet the children and bring them together? What will you do to bring closure at the end of the day? What memorable literacy rituals will you implement? Reread Celebrate Language and Accelerate Literacy, by Nellie Edge, ©2012. What new engaging activities and multisensory teaching strategies will you use to accelerate literacy and reach high Common Core State Standards? How are these practices supported by literacy research, “best practices” research and the science of how the young child’s brain learns best? Teach ABC Phonics: Sing, Sign, and Read!, monitor progress. What did you notice? What do you notice when you begin singing and signing a favorite song? How are your children responding? Are they teaching each other? How do parents respond? How do you systematically use the signing of songs to accelerate literacy? Refer to our Magic of Signing Songs DVD and literacy manuals. See ASL instructional Video Clips to practice. 9. Make Voracious Vocabulary Learning a Daily Priority: Give Little Kids Big Words! Analyze your curriculum and make a plan to systematically build high-level vocabulary through literature and studies. What wondrous words will you introduce and integrate into the curriculum? How will you know if your children understand basic language concepts (backward, forward, farthest, nearest, always, never, etc.)? Systematically and intentionally teach Common Core State Standards vocabulary (e.g., illustrator, author, fiction, nonfiction…). Describe your plan for parent collaboration, communication and education. Adapt any Nellie Edge parent letters to meet your needs. Develop your parent information notebook (each of our literacy manuals contain articles that you may want to include). Plan how you will develop your parent lending library. How will parents be encouraged to be a part of your classroom community and a partner in meaningful learning projects at home? Plan for monthly “Good News” post cards to go home to families. 12. Understand and Use the Common Core State Standards for Curriculum Mapping. Plan how you will share these high international standards with families. See Common Core Standards. The above projects are only suggestions; you are always encouraged to design a practicum to meet your specific needs. Dr. Lifson wants this assignment to be meaningful for you.